The Marine Stewardship Council (MSC) is an international non-profit organisation that sets standards for sustainable fishing and supply chain traceability. These standards meet international best practice guidelines for certification and ecolabelling and and two types of standards were developed: The MSC Fisheries Standard and the MSC Chain of Custody Standard. The Fisheries Standard measures if a fishery is well-managed and sustainable. Only seafood which has been caught by fisheries which care for the environment can be labeled with the blue MSC label. 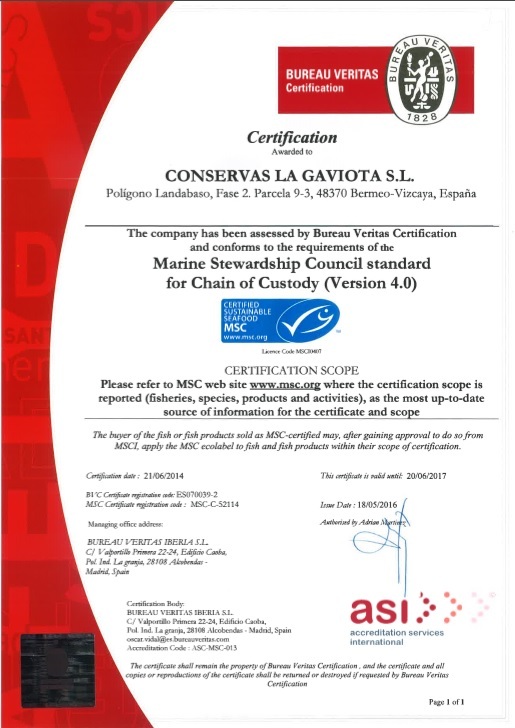 North Atlantic albacore artisanal fishery and the Cantabrian Anchovy are now MSC certified. Arroyabe preserves are mainly elaborated with White Tuna and Anchovies caught in the Cantabrian Sea by basque fishermen’s guilds, which are MSC certified. The MSC Chain of Custody Standard is a traceability and segregation standard that is applicable to the full supply chain from a certified fishery to final sale. This indicates to consumers that MSC labelled seafood comes from a certified sustainable fishery. Every company in the supply chain ditributing an MSC certified product must have a valid MSC Chain of Custody certificate. Arroyabe has fully completed the certificate’s especifications, as well as assures that all its suppliers of MSC certified fish have this certificate.